Our living rooms could be pretty cramped come Christmas 2014. 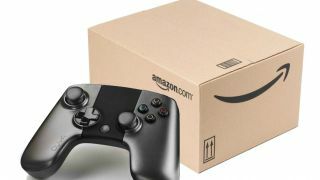 Talk of Amazon's Android console has just surfaced again with promises of a box arriving this year, but with Ouya and GameStick having already taken an unsuccessful swing at bringing Android gaming to the TV, it's easy to be somewhat nonplussed by the news. Yes, Amazon has the advantage of being a big name and a respected distribution platform. Kindle Fire owners have been downloading games on their tablets since 2011, and Amazon's appstore is in place and ready for developers to jump in. But even with all that, betting on the microconsole wouldn't be wise right now. Moreover, $300 (or just under) is a lot to ask for an Android console when you put it next to the $100 Ouya. It doesn't strike me as a wise move at all. The problem is that Amazon is potentially moving into this market at a very tricky time. Valve is pushing PC gaming in from the other side with its Steam Machines offensive. Meanwhile the PS4 and Xbox One sit in the middle, confidently betting on traditional graphical might - and Sony has an ace up its sleeve with PlayStation Now. With an entirely cloud-based entertainment experience, beamable to all our devices, on the horizon, why would we opt for a box that risks being so quickly outdated? As for Apple, it has the advantage of already having its gaming trojan horse on the market in the form of Apple TV, its controller currently nestled in our pockets and ready to go. Even our smart TVs are becoming more capable of running games natively without the need for any extrernals. So if Amazon does have something in the wings, it will need to offer up a lot more than just gaming. Apparenty the box will offer music, TV and movies as well, so I suspect this rumoured gaming device is in fact the same set top box we've also heard about. But it's going to have to do a lot to convince gamers that it's worth picking up. Because while I believe there's a market for "inbetweeners" out there - the ones who'll enjoy a halfway house between Candy Crush and Titanfall - it's not a market that will buy a $300 box so they can play Tiny Wings on their HD TV. Maybe if Amazon has some killer exclusives that will change, but right now its app store is limited when compared with Google Play. Amazon does have the advantage of having a lot of weight behind it, which is something that the kickstarters haven't benefited from. But it needs to be careful to not fall behind the times in an industry that's changing faster than ever.